I know I just wrote about Mom and her social whirl but I spoke to her yesterday and she had just attended the Thanksgiving event at her club, The Moose. This happens every year, the Thursday before the holiday. Everyone brings a dish and they all share a meal. So, I said “Mom, how was it?” She said, “As always, a load of crappy food, but the ham was good and they gave you a big slice.” So there you go – no turkey but a nice big slice of ham. Mom took cranberry salad but only after I told her to make something. Her original idea was to buy a can of jellied sauce and put it in a glass bowl. Like that’s going to fool someone. So she made her salad – everyone liked it but she said the sweet potatoes were a weird brown color and the pumpkin pie was not cooked in the middle and that was crappy as well. And of course no REAL whipped cream. Mom better get used to that – in Cincinnati next week she will be having Cool Whip with her pie. Speaking of Cincinnati, my family is gathering there next week including both the new grandbabies and their parents and Mom, too. Our dear friends have offered us their house on a lake and I have been going nuts trying to please everyone and organize everything – meals for 8 adults and 2 babies etc. etc. It’s almost like planning Adrienne’s wedding all over again. Anyway, I am so stressed out I did something crazy today. 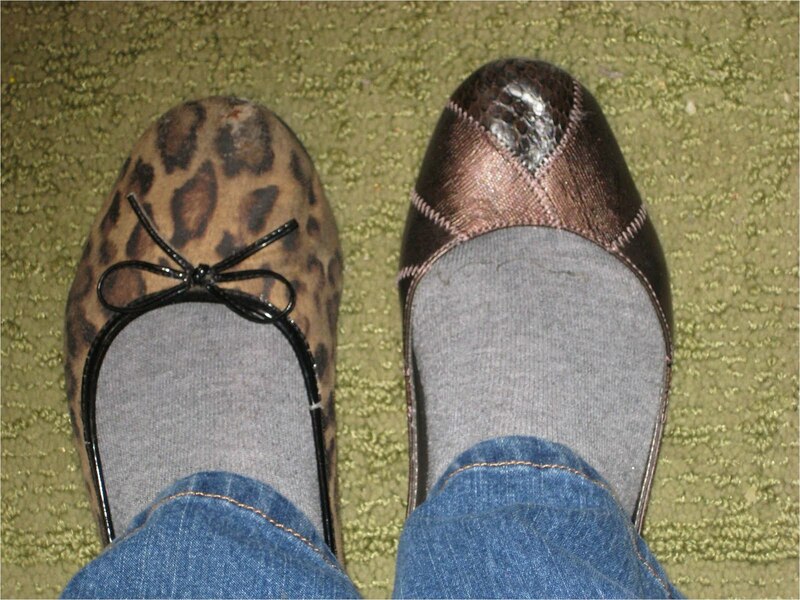 I was in a dressing room in the mall and looked down and saw I was wearing TWO DIFFERENT SHOES!!! And one of them, the cheetah flat is part of a really old pair I only wear out to the mailbox or to sweep the porch (I don’t ever actually sweep the porch but I do wear them outside). Have a wonderful thanksgiving, filled with cooked pies, a nice turkey and SHOES THAT MATCH. Blessings to all of you. Your stories about "The Baba" make me laugh and wish I lived nearby. Timeless stories, really. Nothing to worry about for Thanksgiving - you are the most talented hostess I've ever known, and I'm sure everyone will have a wonderful time. How incredible that you'll all be together! Happy holidays - say hello to my cousins and kiss those babies for me! Marvel at the wit and imagination of a respected author! Thanks Stephanie! It is always so nice to hear from you. Those babies are sure to love their great Baba. Hope you have a great Turkey Day! Will you be with your folks?